Nakumatt Jumbos defeated Kenindia-BTB Rangers by 72 runs in the 10-over fun cricket festival started at the Nairobi Gymkhana on Friday morning.Sati Bhogal stroke an unbeaten 24 from 29 deliveries. Rangers, who lost the toss could only manage 50 in its allotted 10 overs, and thus lost by 22 runs. Vekaria shone with both bat and ball and was the top scorer for the Rangers, with an unbeaten 22 of 23 balls. 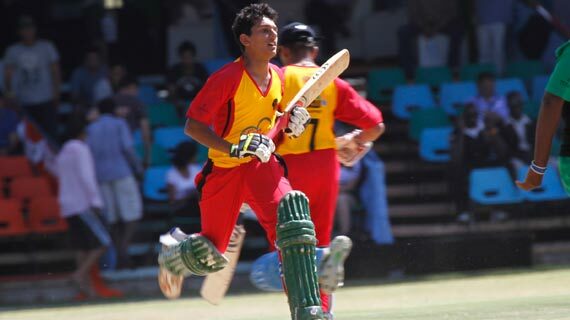 His team mate, Shasikant Sanghani, scored three runs before he was trapped leg before by Jagdish Khetani after facing 10 deliveries. In the second match of the day, Tee Vee Tigers won by 8 wickets against Tribe Warriors condemning them to 67 for the loss of 7 wickets. The Warriors top scorer was Josphat Ababu with 14 from 11 balls before he was run out. Tigers top scorer was Australian Ian Harvey with 37 not out from 18 balls. Harvey is one of the four former international cricketers who have graced the Zuku Cricket Wars fun festival which ends on Sunday.The other three are Andrew Symonds, Damien Martyn(Australians) and New Zealand’s Chris Cairns who led his side to a win against India at Nairobi Gymkhana during the finals of the 2000 International Cricket Council Knock-out Trophy. Other teams for the day included clashes pitting Mayfair Mavericks against Top Fry Simbas and Rising Star against DTB Titans. “We want to urge Kenyans and the cricket federation to come up with ways of promoting cricket in the country. Said ,” said Zuku CEO Richard Bell before the tourney commenced. The three day tourney has attracted a total of 149 players exceeding the planned 130 players and about 14 corporate sponsors. There is also extensive line up of international entertainers and Bollywood actors including Barun Sobti.Apoorva Agnihotri, Shilpa Saklani.Manav Gohil, Madhura Naik and Deljit Kaur Bhanor. Proceeds from the tourney will be used to support the newly set up Children’s Village in Naivasha that recently admitted first eight residents, six of them orphans from the Familia IDP camp in Mai Mahiu. Zuku, Nakumatt, Kenindia Insurance, Tribe Hotel, Tee Vee Insurance, Mayfair Insurance, Diamond Trust Bank, Rising Star Commodities and Menengai are the tournament sponsors.